SUPERB ALL ROUNDER FROM HONDA! We are delighted to be able to offer you this brilliant 471cc all-rounder. 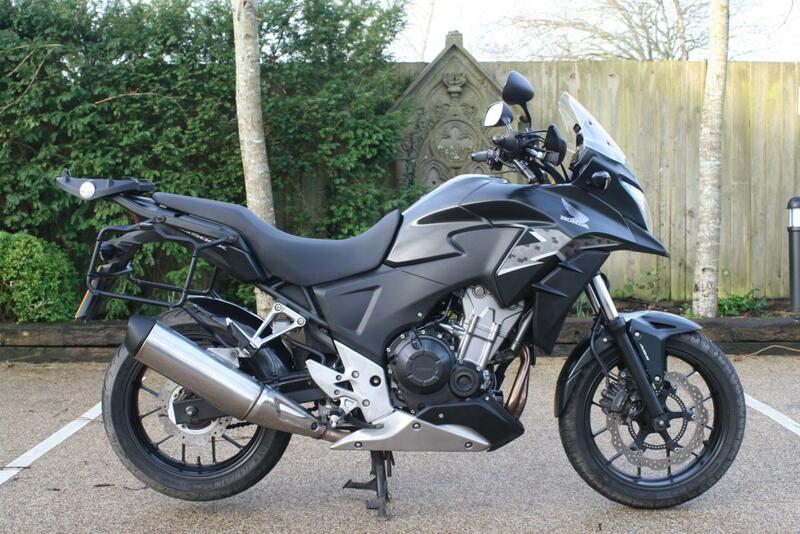 2 owners from new this bike boasts a full service history and is offered in excellent condition. Fantastic value for money and a great commuter. Powered by Honda’s 471cc twin cylinder motor, producing 46.6bhp making it A2-licence compliant and that’s where the CB500X comes into its own. Whether you want to take a brief trip through the rough city streets or explore the endless vistas of the open road, the CB500X is ready. Its 41mm telescopic forks and Pro-Link rear monoshock offer smooth, extended travel to absorb hits. Both are adjustable for spring pre-load, tailoring the steering geometry to accommodate a pillion and full luggage. The CB500X is designed to handle any kind of terrain. An increased ground clearance improves performance on rough roads, and three extra degrees of turning angle on the handlebars gives you outstanding handling. A 19-inch front wheel improves stability and roll-over ability, and block-pattern tyres ensure tenacious grip and feedback. The raised windscreen keeps you protected for a more enjoyable ride. Low rate finance is available on this bike, credit subject to acceptance. For a no obligation finance quote please call 01747 811196 and select option 1 for sales. Thanks for looking! !